Many of us follow up a shampoo with a regular conditioner that is washed off. The conditioner helps seal in the moisture into the hair and keep your locks shiny and bright. But since it gets washed off, some argue that a conditioner which remains on the hair after wash gives better results. These leave in conditioners are either creamy or come in the form of gels or sprays. They are used on damp hair after rinsing off the shampoo and remain on your hair. The leave in conditioners are light, adding shine and protection to your hair. What is even better is that such light leave in conditioners can be made at home, with the natural ingredients that you have at hand. 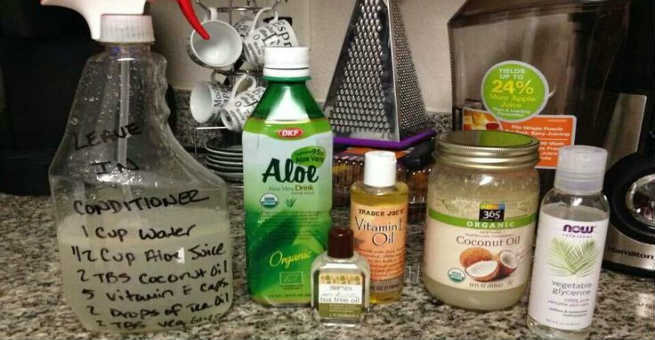 You can finish off your hair wash with a DIY Leave in conditioner and get gorgeous hair right at home! Lets take a look at some DIY Leave in conditioners that you can whip up. When you make leave in conditioners at home, it is most effective to use light ones that go into a spray can. They are mostly water based. You can up the amount of oil in the conditioners if you want extra moisture from it. Take 1 cup of water and add a few mint leaves to it and boil. Once it cools, strain it and add quarter to half a cup of jojoba oil to it, depending on how dry or oily your hair is. Take more oil if you have dry hair. Now transfer the contents to a spray bottle and keep in a cool place. Shake it well before each use and spray on damp hair before getting out of the shower. The conditioner will soften the hair from root to tip and also prevent any scalp infections. Take 1 cup of water. To it, add 1/2 cup aloe juice and mix well. Add 2 tbsp of coconut oil and glycerin each. Next add a few drops of tea tree oil and vitamin E oil. Transfer the contents to a spray bottle. Shake well before every use and spray generously on the scalp and body of the hair after rinsing the shampoo. The tea tree oil prevents dandruff, the aloe vera soothes any scalp irritation while the coconut oil and glycerin add shine to the hair. The Vitamin E oil strengthens the hair from root to tip. Shea butter is a natural waxy substance that has deep moisturizing properties. You can pick up a large tub of the butter and scoop out 2 tsp of it. Melt it in a double boiler and add 2 tsp of jojoba oil to it. Mix well so that the liquid is homogeneous. To this add a cup of distilled water and mix well. Transfer to a spray can. Shake it well before every use. Spray this into the hair after every wash, when your hair becomes almost dry. The conditioner helps in moisturizing frizzy hair and making it super smooth and manageable.